Wine lovers are discovering wine trails all over the country. Whether you are seeking spectacular scenery or great wines, there is a wine trail for you. Here are a few tips to follow for a memorable wine trail experience. How to select wineries you will like in an area you have never been to? Do some online research and check out the website for the region and wine trail. The official website will have maps and trail guides with lists of the wineries on the trail. Special events are listed on websites, as well as links to individual winery websites. Spend some time browsing websites and find wineries that offer wines and the experience you are looking for. Most wineries have wine tasting hours throughout the week and weekend. If you want to plan your trip around a special event, you may have to pre-purchase event tickets in advance. 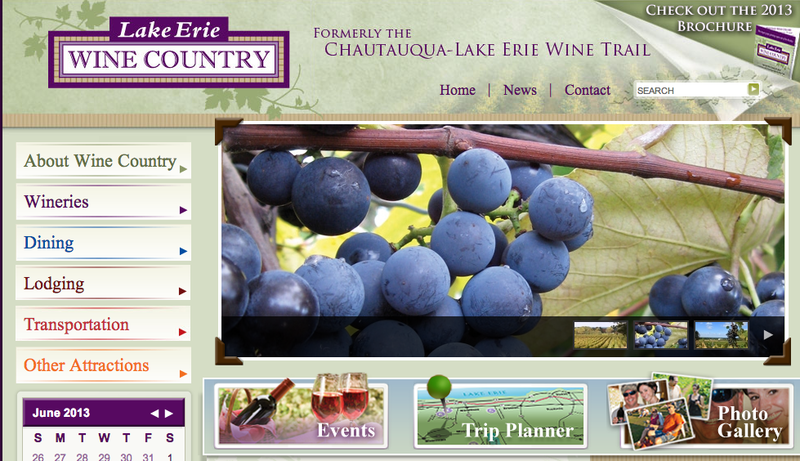 The Lake Erie Wine Country website home page is user friendly and has a wine trail brochure download feature. How many wineries are ideal to visit in a day? If you only have one day, select wineries that are in close proximity to each other. If you have a weekend or several days, you can visit three to four wineries each day. Give yourself lots of time to sample and enjoy each winery’s unique experience. If you are not into crowds, weekdays tend to not be as busy and tasting room staff have more time to talk about the wines and winery. What resources exist to plan your trip? Many wine trail and state association websites have trip planner features. 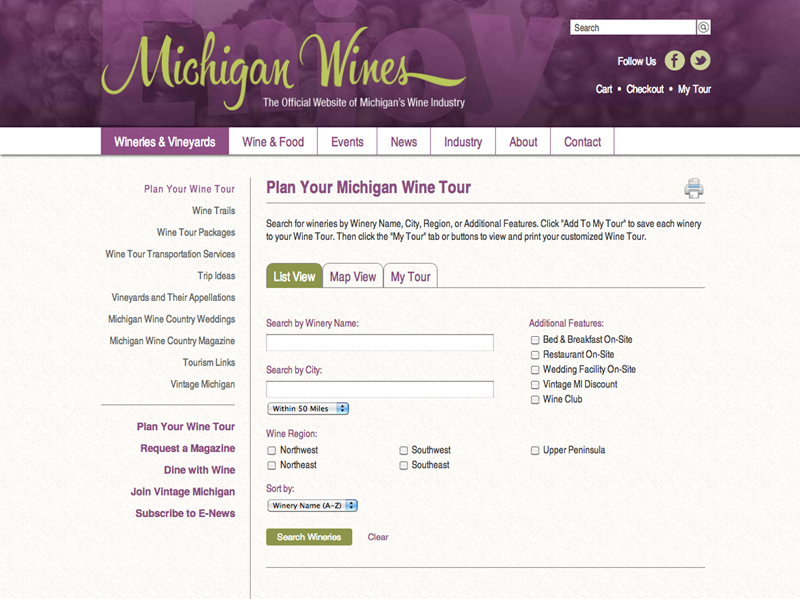 A great example is the Michigan Wines website which has a ‘Plan Your Michigan Wine Tour” page. It allows visitors to search by winery name, city, or region, then save the selections to ‘My Tour” to view later or print a customized Wine Tour. Where do you look to find information for wineries and wine trails? Localwinevents.com is the world’s largest calendar of food and beverage events where consumers can find information about events in their area. State tourism, Convention and Visitor Bureaus and local Chamber of Commerce websites promote winery attractions and wine trail events and are a wealth of information for the wine trail traveler. Midwest Wine Press has a calendar of unique and distinctive events plus a list of all the wine trails in the Midwest with links to each wine trail’s website. What to bring along? Don’t forget your ID. Wineries will not serve those who do not look old enough to drink alcohol. It is the law and there are no exceptions. Bring along water to drink in between samples and winery stops to keep hydrated. If visiting several wineries, designate a non-drinking driver or book a wine tour through a professional tour company or limousine service which allows people to safely and responsibly visit wineries. 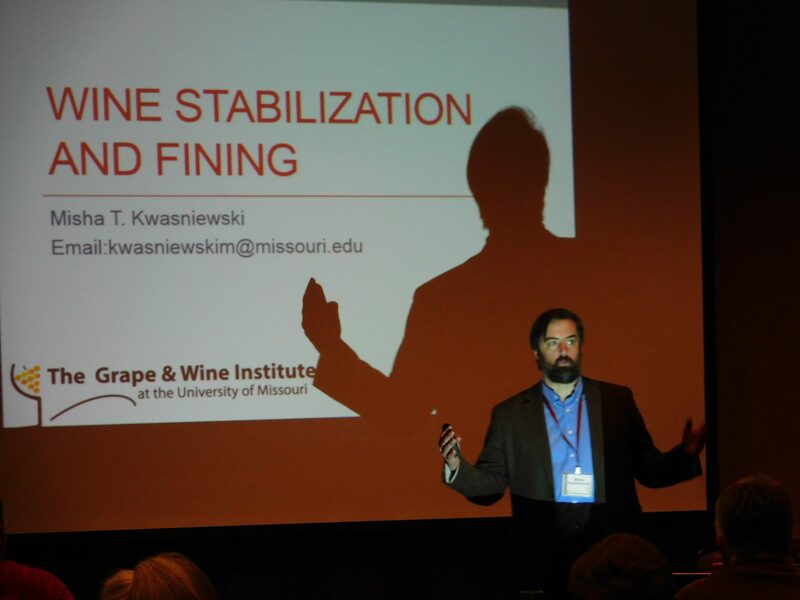 Tasting fees to sample wines are becoming more common so be sure to bring cash or a credit card. Remember to take a break. 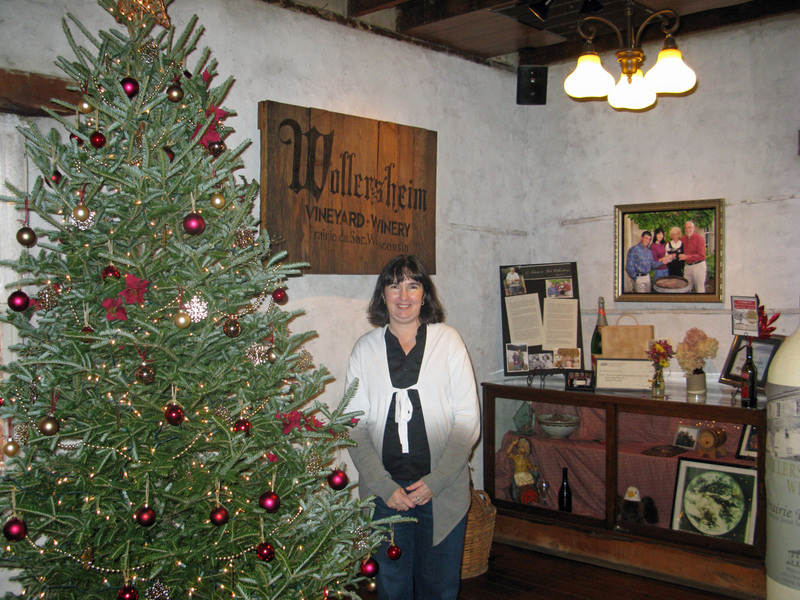 Enjoy a meal at one of the restaurants or winery bistros along the trail to experience the food culture of the region. Many winery gift shops offer local selections of cheeses, sausage and crackers for wine tasters to snack on during their travels. Take a break and do some shopping at other tourist attractions in the area such as antique shops, local artists, specialty chocolate shops, gourmet meats, artisan cheese makers and farmers markets. 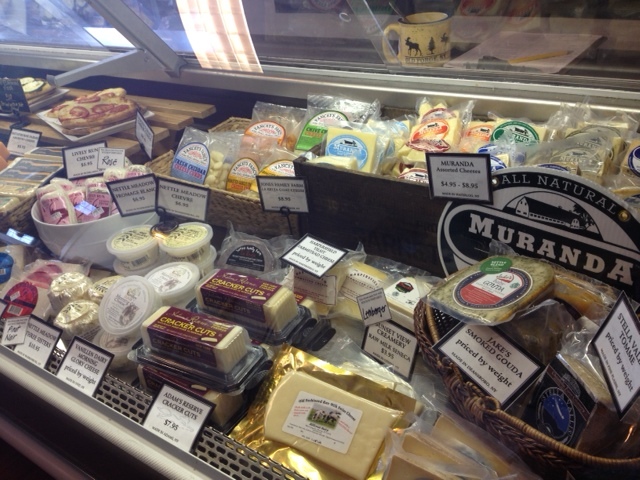 Fox Run Vineyards in the Finger Lakes in New York, offers local artisan cheeses in their deli. Do you need lodging? Should you choose to stay for one or several nights, wine country is the perfect getaway. Wine country is a popular destination so plan ahead and reserve accommodations in advance. Most wine regions have bed and breakfasts, hotels and motels that can be booked online. For the best lodging recommendations, call the local Convention and Visitor Bureau or Chamber of Commerce. Those folks know the area and can assist with specific lodging questions. Follow these guidelines for a memorable wine trail experience that you and your loved one or friends will remember. Enjoy your travels! 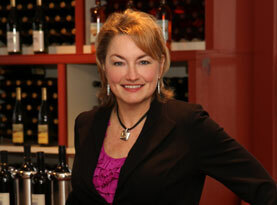 For more wine trail tips, email patty@pattyheldconsulting.com or check out her website, www.pattyheldconsulting.com. Two other great sources for finding wineries and planning tours are wineweb.com and catchwine.com. Thanks for the suggestions! Yes, they are great resources also.